Will Jennings Hold Out? ~ The Bucky Channel - The World of Sports from Wisconsin's Perspective. 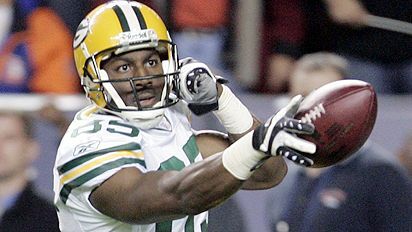 Home » Donald Driver , Green Bay Packers , Greg Jennings , Ted Thompson » Will Jennings Hold Out? In a league where you can be an unproven rookie and have tens of millions of dollars guaranteed to you, many veterans begin to get a little upset when they realize they're making below the curve. And when you come off a season with 80 receptions, 1,292 yards, and 9 touchdowns, you probably start to think about how you can cash in on those numbers. That's the case Greg Jennings is going to find himself in this offseason. He's set to make just $530,000 next season, but is clearly worth more than that. In his short career, he's already emerged as the Packers best receiver as well as one of the best receivers in the game. Jennings says he's 99.9% sure he's not going to hold out, and that he wants to continue to wear the Green and Gold for years to come. He says he has no problem playing out his contract, and then seeing what happens. But it's in the Packers best interest to keep him signed as soon as possible, with as little distraction as possible. Last year we saw enough distraction in Titletown even without the whole quarterback fiasco. Ryan Grant wanted more money, Thompson low-balled him, and then it took forever for the two sides to agree on anything. Thompson should just call Jennings up to his office and say, "You made me look good by taking you with a 2nd rounder, how much money do you want? ", and then give it to him. Sure, he'll drop a ball here and there, but Jennings is a big-time receiver, one that needs to be a Packer for years to come. Oh, and don't get rid of Driver either.